.... specially if you are going to send them from Phils. to US and other countries. We also know that during holidays post office is jam packed with cards so there is really a delay in the delivery. It is also worst when your cards will get lost along the way. We had experienced that when our relatives abroad thought that we never sent them cards when it fact it was lost somewhere. 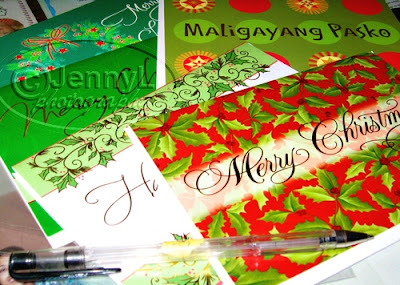 I also remember mailing my Christmas cards middle of Dec. already and oh gosh it was already mid- January when my relatives in the US received the cards, lol. So i think we need to send them early Dec. so they can receive it on time. I already sent some to my relatives hehe.. I started mine too Te Jen. Last year kasi January na din dumating yun mga pinadala ko, haha... kaya early ako today. We started taking family photo for the card baka next week printing na ko. I have few photo card templates kaya medyo matrabaho but it's so good to see pag tapos na, hehe... have fun with the xmas preps..